These cello excerpts from Puccini's Tosca have been edited by Daniel Morganstern, who has served as solo cellist for the American Ballet Theatre at the Metropolitan Opera House in New York and the Lyric Opera of Chicago for over three decades. He has also been principal cellist of the Aspen Festival Orchestra, the American National Opera Company, Joffrey Ballet, and the Orchestra of The Dartmouth Congregation of the Arts. Tosca is a melodramatic opera in three acts by Giacomo Puccini set in Rome in June 1800, during a period when the Kingdom of Naples's control of Rome was threatened by Napoleon's invasion of Italy. It premiered in 1900 in Rome, also during a time when the country was experiencing political and social unrest. The premiere of a Puccini opera was a national event, and although Tosca had a somewhat lukewarm reception at first, it was quickly followed by multiple performances given to packed houses. The opera is written as a through-composed work, with arias, recitative, choruses and other elements musically woven into a seamless whole. Throughout the opera, Puccini uses leitmotifs to identify characters, objects, and ideas. However, unlike Wagner (who is most notable for his usage of leitmotifs), Puccini does not develop or modify his motifs, nor weave them into the music symphonically. Instead they are employed almost as stand-alone musical references that fit within the narrative. Today, Tosca remains immensely popular, if somewhat critically under-appreciated, and it also contains some of Puccini's best-known lyrical arias. 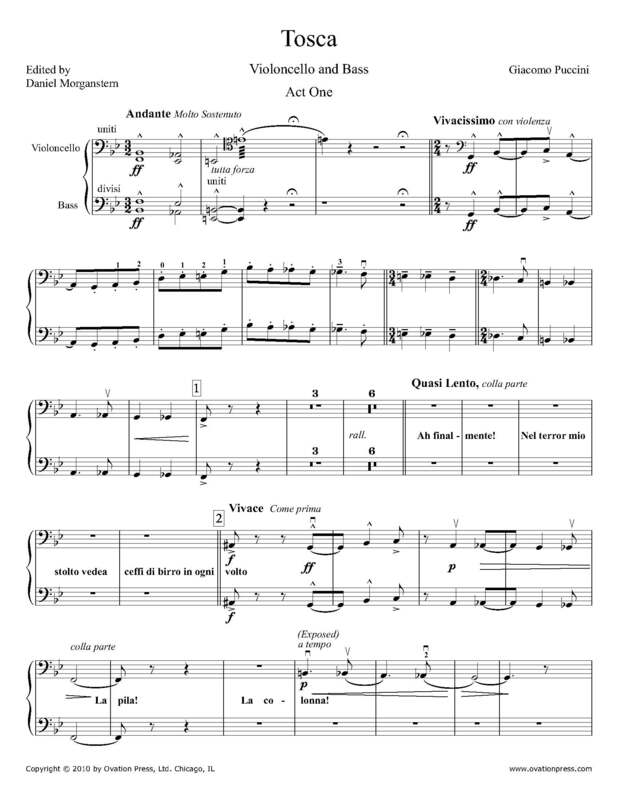 Download and print the score today to gain access to expertly edited Puccini Tosca cello fingerings and bowings for these excerpts from Daniel Morganstern! Please note: The Select Passages score contains all of the more difficult passages in Tosca and includes the cello quartet in Act III.